After you choose a title, the digital book opens and your child sees and hears the story being read. As well as looking at the original art work, kids can read along with the spoken story, because words are lit up to help them focus. Navigation is easy and works well. I also loved the music and sound effects which add a little atmosphere to each story. If kids are independent readers, they can turn the sound off and read without help. There's a tour you can take that explains it all much better than I just did, and you can enjoy the sample book, Pete's a Pizza, without logging in, plus send someone access to a book for two weeks as a trial. There's a special place for parents on the site that shares resources too. It explains a little about each book, and provides articles that support some of the books. There's a real emphasis on encouraging parents to read to their kids, and not pressure them to read before they're ready - Book Chook Feather of Approval! 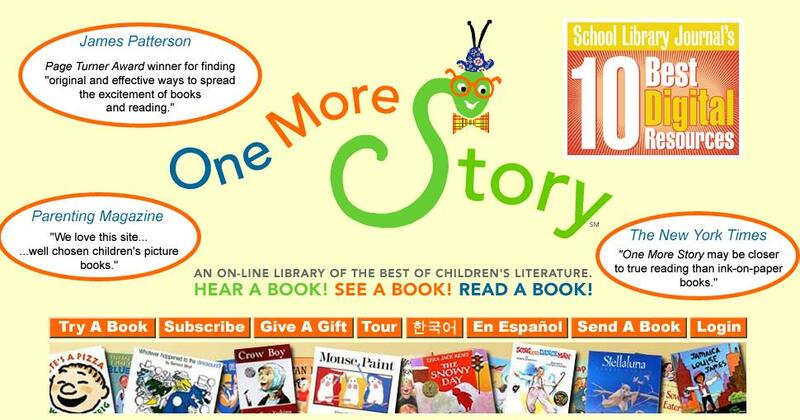 Sites like One More Story will never replace the emotional closeness of a parent reading aloud to a child. However, I think it's a great idea to swap mindless screen time with this more educational screen time - by following along with the story and hearing it read aloud while they simultaneously look at the words, kids are learning to read and becoming exposed to new literature. One More Story might be where they first experience Martin Waddell's Owl Babies, but then they might recognize or ask for it at the local library, or ask Grandma to buy it at the book store. 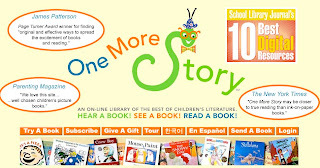 Alex from One More Story is offering one lucky The Book Chook reader anywhere in the world the opportunity to win a one year home subscription to One More Story. A teacher or librarian could also use the subscription at work. To enter, simply email me (via the Contact Me tab above) with One More Story in the subject line, and include your name and email, so I can contact you if you win, to forward your details on to One More Story. The winner will be chosen one week from today. And that's not all! Each The Book Chook reader is eligible for a discount on subscriptions. Instead of $US44/year, $US27/six months and $US15/three months, which entitle a home user to unlimited access, Book Chook readers pay $US36/year, $US25/six months and $US14/three months. To take advantage of this offer, all you need to do is enter "bookchook" in the promo code space at One More Story's website. A question: would it be available on an ipad? I like the idea of coupling online stories with IRL reading. I can see my children enjoying a site like this. It would be like learning to read without realising it. I scoured the site's FAQ and I don't know the answer to that, Kelly. If the free sample book works on your ipad, I figure the answer is yes. Let me know if you'd like me to email them and ask the question. Learning to read without realising it - EXACTLY! That's why I believe so strongly in reading aloud to kids, singing and talking with them, chanting and playing with words, letting them listen to audio books and read along, having them watch a screen like with One More Story, or even the way Disney has songs and the little ball bounces along on the words. All those things are fun and kids learn to read almost subliminally, absorbing the skills by osmosis it seems! It's also why when I read one on one with a child on my lap, I make sure he/she can see the words and I often run my finger along underneath them. No need to enter me -- I just posted this on win a book! Thanks so much for spreading the word on the giveaway, Mary!